We're excited to partner with West Michigan Sustainable Business Forum's "Imagine Trash Partner Program" for ArtPrize Nine! Are you an ArtPrize Nine venue? Interested in reducing your environmental impact by starting, expanding or streamlining your facility's recycling and composting? We've got you covered, with a special promotion to get you on your way. In 2016, we partnered with the Wege Foundation, the City of Grand Rapids, Kent County, West Michigan Environmental Action Coalition (WMEAC), and The Image Shoppe to bring the S.O.R.T. 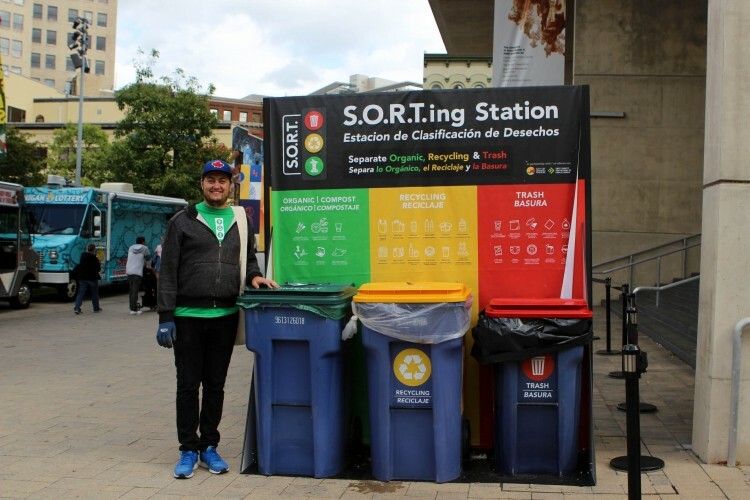 event recycling program to ArtPrize Eight - providing waste-sorting stations, volunteers and educational support at six stations throughout the eighth annual event. The program ultimately won the Governor’s Excellence in Recycling Award and set a new standard for recycling and composting. This year, we're challenging ArtPrize Nine Venues to adopt S.O.R.T. (Separate Out Recycling and Trash) practices of their own - and we've got everything you need to get started. Be prepared to provide information on your current trash and recycling services, including a recent invoice. Walk-throughs require approximately one hour of facility access.